So, I didn’t watch a horror movie a day during October..but I did watch SOME movies! That’s just life, being life and movies getting watched when I can watch them! Yup! Let’s All Go To A Postmasters Convention! Eat Candy! Get a Toothache! See The Future! Beware of Mad Scientists! Peter Lorre carries a CAT in his coat pocket!!!! Little Shop! No Music! Just a hungry plant! FEED ME! I am now at 128 new movies and 55 re-see movies. Slow and steady, but ever watching! My highlight of the month was just finding DEAR HEART on TCM and watching it! It had been a while since I caught a movie at it’s start to watch to the end. 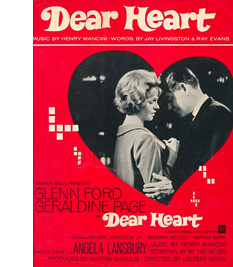 DEAR HEART; Geraldine Page, a postmaster at a Postmasters’ convention, in a big city. She wants to feel special and have a good time! She’s longing for love, but won’t just settle for a convention affair. Glenn Ford, he’s a traveling salesman, ready to settle down, but has he “settled” for the woman with a kid because it’s the thing to do? These two meet and there’s some kismet, but is it meant to be? Ahhh, LOVE! Movie love! TRIVIA: Geraldine Page is Madame Medusa in THE RESCUERS!!!! WOOT! MASTER MINDS was another movie I found on TCM, it features the Bowery Boys. One of them boys has an incredible sweet tooth, he eats so much candy, he gets a toothache and it gives him the power to see the future! Becoming a sideshow act the boys think they’ve scored the big time! 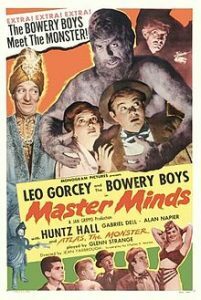 But of course there’s an evil scientist, Alan Napier, on the loose who needs a brain for his STRONG, HAIRY MONSTER MAN ARMY. A mix up, fortune telling and lots of sugar made this a sweet, cute flick. 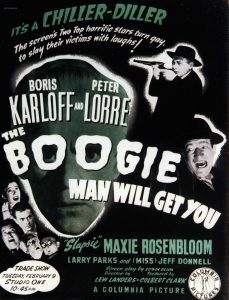 My guy Dave found me THE BOOGIE MAN WILL GET YOU on YouTube. It was a real delight. Boris Karloff has an old home that houses his experiments. He’s trying to creature a super army race too, but seems to be killing the traveling salesman that come to his door, though it is all in the name of science!! A young woman offers to buy the house to turn it into a hotel and as she tries to fix it up, a mix of characters stop by, including her ex-husband. Are people really dying? Who’s the killer? Is it the boogie man? 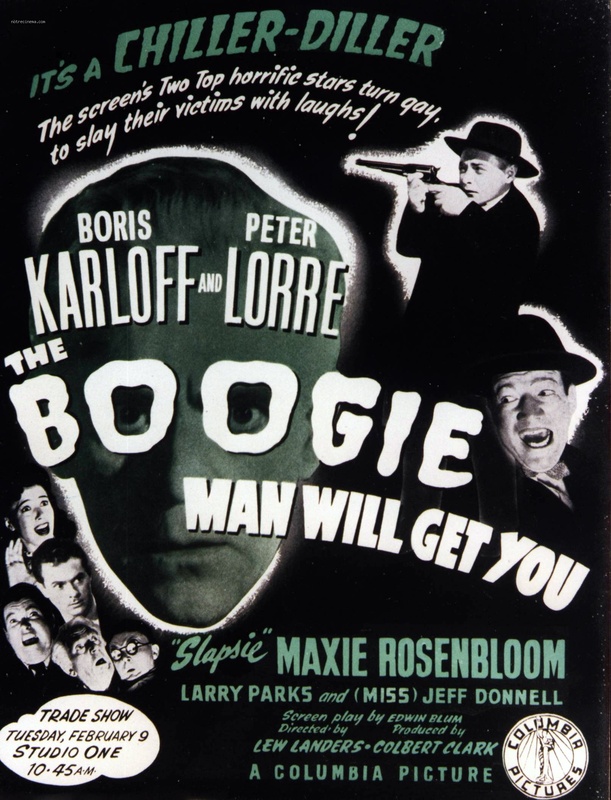 Peter Lorre is the town’s doctor, sheriff, tax collector and he carries a cat in his pocket. It’s completely silly, and it made me laugh! 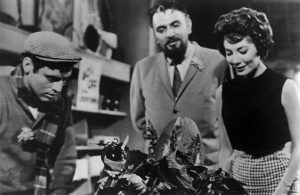 Then last but not least, I’m just going to stick with highlighting the oldies, I re-watched the 1960 LITTLE SHOP OF HORRORS! Thanks again TCM for this one! I watched it with my niece and it’s very nice that I can get them to watch old Black & White flicks! I just love Roger Corman movies! My nieces dug it too, though Effie didn’t like the ending. Alas, only a handful of movies viewed in October, but some fun discoveries for sure! I’ll get around to more of the new releases sooner or later! Yup! HAPPY MOVIE watching one and all! 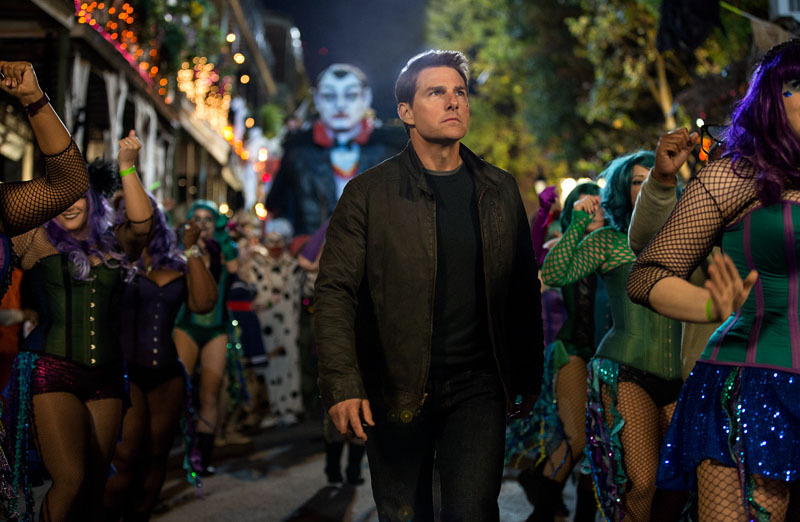 May November be filled with more movies! Yup! Next Next post: An L.A. Comic Book Convention On A Sunday!